THE Pink Ladies benefited from a trolley dash at Checkers. As part of the supermarket’s rebranding, it wanted to highlight the work done to brighten and modernise the store. Manager Allen Edwards said it was also a way of thanking customers for putting up with the work. ‘With the current financial climate and the most expensive time of year coming up, with people buying presents as well as their weekly food shopping, this was the best way to pay back our customers’ loyalty,’ he said. Please click here for more information. 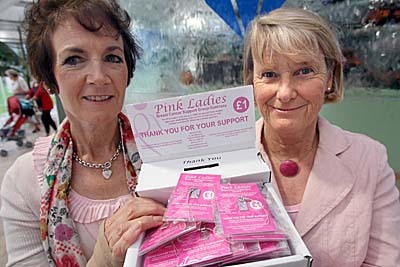 A LISLET beauty salon opened its doors at no profit at the weekend to raise money for the Pink Ladies. Please click here for more information. THE DVD of this year’s Pink Ladies’ Sunset Coastal Walk is now available to buy. The proceeds from their sale at £5 each will go to the breast cancer support group. This year’s walk, which attracted more than 2,000 women, was held in celebration of the life of the group’s co-founder, Ann McMillan, who lost her battle with an unrelated cancer last year. Please click here for more information. 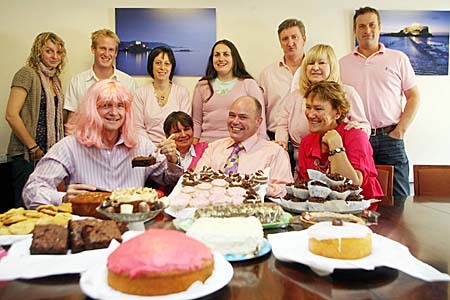 STAFF at a finance company were wearing and eating pink yesterday to raise money for the Breast Cancer Campaign. Argyll Investment Services supported the international mufti day. Staff also made and sold their own pink-themed cakes ‘Wear it pink’ day also marked the end to Breast Cancer Awareness Month this year. Please click here for more information. CHARITY charms have been launched as part of Breast Cancer Awareness Month. The small charms, costing 1, are designed to go on handbags or phones. Please click here for more information. A new support Group has been formed in Guernsey, called "Guernsey Cancer Support". Please click here for more information. Please visit www.breastcancercare.org.uk or telephone their helpline on 0808 800 6000 for more information on the events listed below. Please click here for more information. A SCIENTIST who has developed an equation that could be used in the future to test whether someone will get cancer visited the island this week to discuss his research. 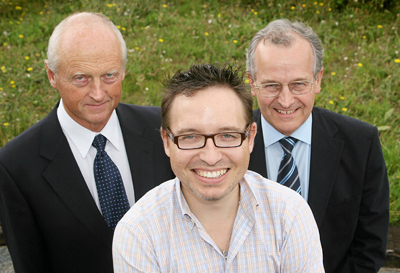 University of Southampton professor Paul Townsend thanked the island for its contribution to his work – all money raised through Hope for Guernsey goes to help his research. But the Guernsey connection to the research goes much further, as samples donated by 11,000 Guernsey women 40 years ago have been used by Dr Townsend to identify certain tell-tale signs of breast cancer. Please click here for more information. 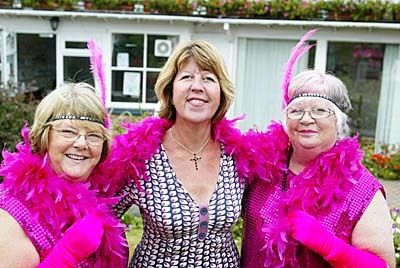 LES Bourgs Hospice has received £45,000 from the Pink Ladies, half of the money raised by the Sunset Coastal Walk. It will go towards its new development and purpose-built day hospice. Please click here for more information. ISLANDERS who stepped out for charity have raised almost £80,000. Organisers of the Pink Ladies Sunset Coastal Walk are thrilled with what they have raised so far and are keen to gather all outstanding sponsorship. Please click here for more information. LES BEAUCAMPS HIGH students will be braving the waves to raise money for local charities today. Starting at 10am, Levi Turian, 15, and seven other pupils are due to attempt to kayak from Portelet to Fort Grey in under an hour to raise money for the Pink Ladies charity. Please click here for more information. WELL-KNOWN local popsters City Limits are teaming up with the orchestra Highly Strung and Hornified to support the local branches of Mind and the Pink Ladies. And the event neatly coincides with the band’s 21st anniversary celebrations. Please click here for more information. Tomorrows Pink Ladieds Sunset Coastal Walk gives women a chance to stride out in aid of the breast cancer support group, as well as Les Bourgs Hospice. And it's not too late to take part - either register today using the links below or just turn up at the start line on the day. But even if your legs are not up to a sunset stroll, you can help people with cancer - all you have to do is eat. If that sounds more up your street, read on. Please click here for more information. 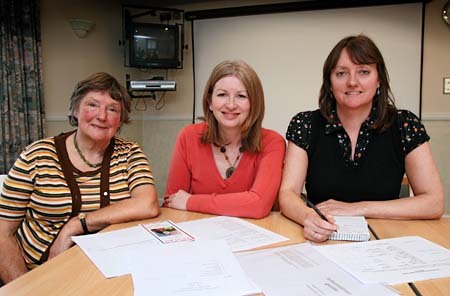 AN IMPROVED service for Bailiwick women affected by breast cancer will begin next month. Health and Social Services has arranged for an eminent breast surgeon to provide an outpatient clinic in Guernsey. Please click here for more information. 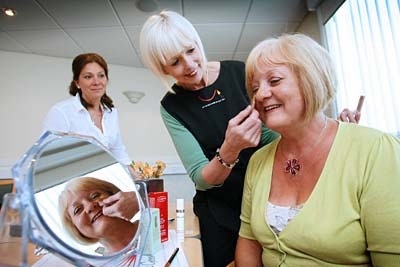 Free beauty treatment workshops available for women who have been diagnosed with cancer Please click here for more information. THE number of women in the island dying from breast cancer is continuing to fall. Please click here for more information. RACE FOR LIFE returns on Sunday 17 May and participants now have the chance to train for the 5km run with athletics star Lee Merrien. Please click here for more information. From improving off-island accommodation for patients to making information available, local group Toucan acts as a bridge between people affected by cancer and HSSD. Nicci Martel found out how it gets patient feedback straight to the people who run our health service Please click here for more information. 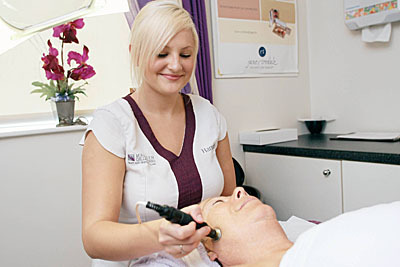 There are countless reasons a woman might want to buy a wig, from the medical to the cosmetic. If you’re in the market for one, Alexandra Logan Brooks has, quite literally, got your beautiful bonce covered, as Emily Burden reports... Please click here for more information. Win a dream wedding worth more than £10,000 A dream wedding will be up for grabs at The Wedding Show next month. Every engaged couple attending the event, which takes place at Beau Sejour on 1 March, will be eligible to enter a free prize draw to win their wedding – a prize worth more than £10,000. The draw will take place on the centre stage at 5.30pm on the day. Please click here for more information.